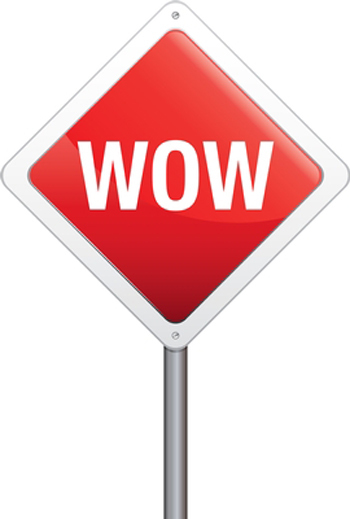 As CEO of a litigation consulting firm offering litigation graphics consulting services, jury consulting services and trial technology support services, I hear the word "wow" quite often from A2L's clients, and I know our talented competitor firms hear the same. Usually, when I hear it, someone has wildly exceeded a client's expectations, one of our people came through in a pinch or someone on our team went without sleep for even longer than the litigator. Whatever the reason for the "wow," I'm thrilled to hear it since it means we've truly delighted a customer. I've written about my passion for good customer service in the past in Litigators, You Deserve Ritz-Carlton-Level Service and 15 Tips for Great Customer Service from the Restaurant Industry. I believe great customer is just a minimum standard in the litigation consulting industry, and at our firm, we are really striving for delight. Here are 10 situations where litigation consultants like A2L Consulting and other firms like ours often hear the word, "wow." Wow, you came in at or under budget: One of well-known competitors has struggled recently, and I think one of the biggest reasons was their constant lowballing on estimates. For them, it seemed every major case was estimated at $25K but the invoice always ended up closer to $250K. At A2L and at other great firms, we do a great job of setting expectations accurately. We often hear a "wow" around budget especially since we so often use fixed fee pricing and other alternative fee arrangements to delight customers. See 12 Alternative Fee Arrangements We Use and You Could Too. Wow, our jury behaved just like the mock jury: It is an amazing experience to watch a group of jurors arrive at a nearly identical outcome to those in a mock jury. While we often emphasize that a mock trial should be used primarily support voir dire, for practice and for hearing how mock jurors reason through your case during deliberations as opposed to a predictive tool, it is still fascinating to see a jury behave quite similarly to a mock jury. See Mock Trials: Do They Work? Are They Valuable?. Wow, the jury loved that demonstrative: When A2L started almost 20 years ago, we were exclusively a litigation graphics firm. We've since become known as one of the best in the jury consulting and trial technology spaces too. Still, after all these years, we have worked on more litigation graphics projects than any other type of project and probably more than most any other firm. Not surprisingly, we often hear about how a demonstrative we developed resonated with a jury. The litigators often seem surprised, but honestly, we're not. It's just what we do. See 16 PowerPoint Litigation Graphics You Won't Believe Are PowerPoint. Wow, you found a way to show that: It is fairly common that I hear this "wow" comment. A trial team, made up of brilliant lawyers, has been working on a case for years. They've struggled to find a way to persuasively describe a particular point, technology or set of facts. Through our creative process, our litigation consultants find just the right rhetorical technique or demonstrative exhibit that conveys a complex point efficiently and persuasively. See Courtroom Exhibits: Analogies and Metaphors as Persuasion Devices and Information Design and Litigation Graphics. Wow, you stayed right there with us: Usually when we hear this "wow" it means we were sleep deprived. More specifically, it is typically one of our trial technicians who was the most sleep deprived. These amazing consultants help make last minute changes to the trial presentation, prepare deposition clips and evidence for display and handle the running of the electronic show at trial that makes a lawyer look like a star or a flop. Often they stay awake for days at a time leading up to trial. See What Does Using a Trial Technician or Hot-Seater Cost? and 11 Traits of Great Courtroom Trial Technicians. Wow, I didn't know people did what you do: We have been litigation consultants for 20 years, but the industry is still quite young. While most litigators understand there are people who do demonstratives, jury and trial work, few understand that litigation consultants can be active coaches to litigators, can support theme and story development and do much more to help a litigator prepare a case. See Accepting Litigation Consulting is the New Hurdle for Litigators and 11 Small Projects You Probably Don't Think Litigation Consultants Do and 11 Things Your Colleagues Pay Litigation Consultants to Do. Wow, our judge praised your work on the record: This happens at least once a year, and my favorite clients take the time to send me the transcript. One judge in the Court of Federal Claims said, "These animations are fabulous. I have to commend the plaintiff . . . it's really fantastic." Another District Court Judge asked if our trial technician could help oppossing counsel get their presentation to work. Wow, you actually helped me improve as a litigator: This is really my favorite "wow" compliment although I rarely hear it. It takes someone with a lot of humility to believe it and then to say it, but some do, and it's amazing. We really do care about helping our clients win, and we hope to leave them a little better prepared for the next case as a result of having worked with our litigation consultants at A2L. Wow, you should have seen oppossing counsel when . . . : This is a wide category of wow. Sometimes we hear this because our trial tech was so much better than the other side's trial tech. Sometimes we hear this because our litigation graphics were so much better than the opposition. Regardless, we're quite competitive at A2L, and we live and breathe our cases. We love winning, but we often love defeating our opponent more. Many of our favorite customers feel exactly the same way. Wow, sorry, I don't have any suggestions for how you can improve: I'm big on post-trial debriefs. I wrote an article titled 9 Questions to Ask in Your Litigation Postmortem or Debrief that I think summarizes my feelings around this topic pretty well. Bottom line though, I love when a client answers my oft asked question, "on a scale of 1-10, how likely would you be to recommend A2L to a colleague?" with a "10." I'm happy to say I hear that answer quite often.